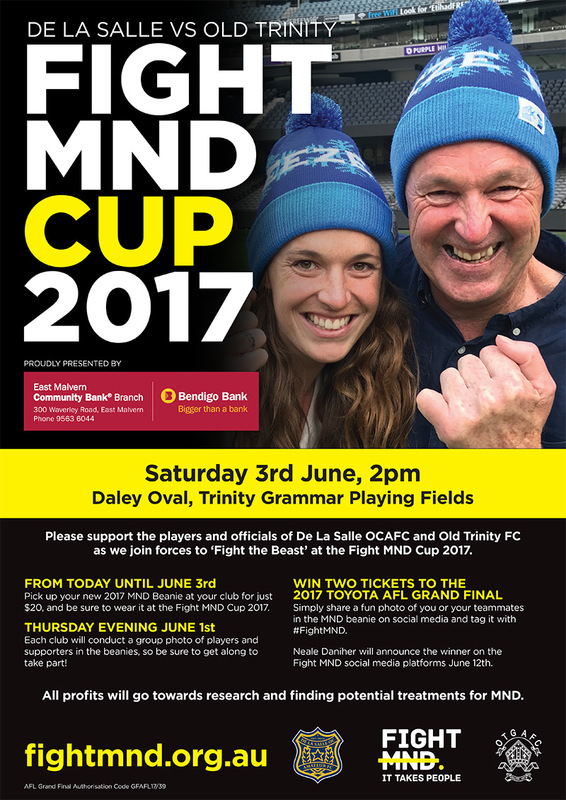 We are pleased to announce that for the second year running, Old Trinity have accepted the club’s invitation to join forces ahead our clash this coming week at Daley Fields, in raising funds and awareness for Motor Neurone Disease (MND). Significantly, this year’s fundraising effort will be further supported by a Presenting Partnership investment. Long-term major partner of De La, Bendigo Bank East Malvern, has signed on in recognition of this groundbreaking initiative by the club. After raising $5,000 together last year through the sale of MND Beanies, next week’s match between the two clubs has evolved further in support of the cause. ‘Fight MND’, fronted by legendary AFL player and coach Neale Daniher, has officially endorsed the sanctioning of the match as the ‘Fight MND Cup’. Co-founder of Fight MND, Patrick Cunningham, was thrilled to see the match between the two clubs evolve. “Taking on this beast takes people, compassion, and sustained effort. We were blown away by the initiative taken by De La last year, and the support of Trinity,” said Cunningham. “To see this year’s match taken to another level, establishing it as a true platform for years to come is very humbling. We are very fortunate to enjoy the support of the AFL and the fans of the game. For that relationship to blossom at grassroots level through De La’s commitment, evolving this match to now warrant the support of a Presenting Partner in Bendigo Bank East Malvern, is extraordinary. Bendigo Bank East Malvern Branch Manager George Prodromidis was equally proud to be involved. 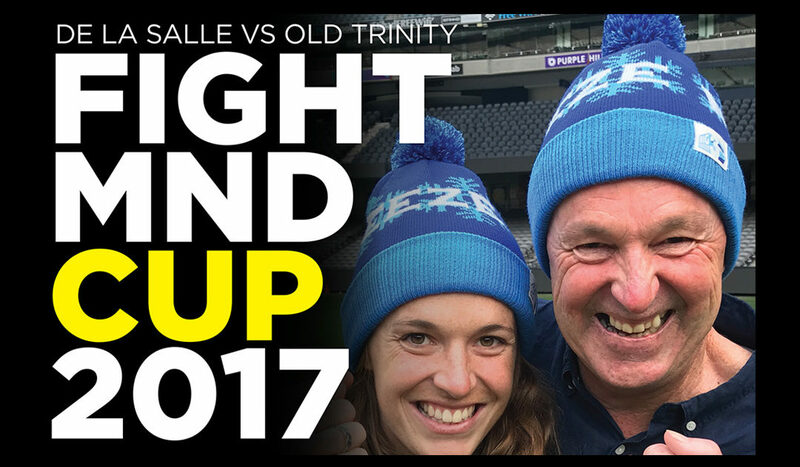 “We are thrilled to be supporting the 2017 Fight MND Cup between our long-time partner De La Salle, and their opponent Old Trinity, as Presenting Partner. To beat MND we all need to work together as a community. As the East Malvern Community Branch of Bendigo Bank, our ethos revolves around very personal service to our local community, and ultimately, giving back to help it thrive. It is vital that we all do our bit to fight the beast, and we commend De La Salle for initiating this event, and Trinity for accepting the invitation to take part and support it. We wish both teams all the very best for the 2017 Fight MND Cup.” said Prodromidis. To support the club’s fundraising efforts, please pick up the new 2017 MND beanie from the canteen or bar area at the club for $20. If you or your business wish to contribute to club’s MND fundraising efforts beyond a beanie purchase, please contact Troy Buntine on 0407877554.